Hoist elevators, otherwise known as material hoists, are widely used in construction projects throughout the world because they allow contractors and builders to quickly transport heavy loads of tools and materials hundreds of feet into the air. As with all construction equipment, it is vital that safety be kept top of mind when operating hoist elevators, and that’s why you should rely on Sims Crane & Equipment for all of your industrial equipment sales and rental needs. Since 1959, Sims Crane & Equipment has provided crane service, rentals, operators, planning services, and more to builders throughout the state of Florida, and we are the renowned experts in the crane and rigging industries. Our safety and education resources are some of the most invaluable resources available for our market, and companies across the globe turn to us as the safety experts. We offer a wide range of equipment that is available for both sale and purchase from each of our 13 statewide locations, and we can quickly dispatch equipment, repair technicians, parts, and operators to job sites throughout Florida. Hoist elevators, just like all of our rental equipment, are available for daily, weekly, and monthly rental periods. We can also provide you with certified NCCCO operators for your rental period or bare lease rental options. We have over 250 NCCCO certified operators, riggers, and flagmen and one of the largest equipment inventories in the state, so you can rest assured that we will have what you need – when you need it! In addition to material hoists, we also offer forklifts, mobile cranes, crawler cranes, tower cranes, rough terrain cranes, all-terrain cranes, and more for both sale and rent. Regardless of whether you with to purchase a single crane for your construction company or need to rent a fleet for your next build, our team of experts can help outfit you with all of the equipment, personnel, and services you need to get the job done right. Unlike most of our competitors, we have state-of-the-art tools to help you plan your projects from start to finish. With services like 3D lift planning, machinery moving, crane service and maintenance, in-house engineering, 24/7 emergency service, and more to help you get your project completed. If you are searching for a reputable supplier of hoist elevators, cranes or forklifts or have any other industrial equipment needs, contact us today. 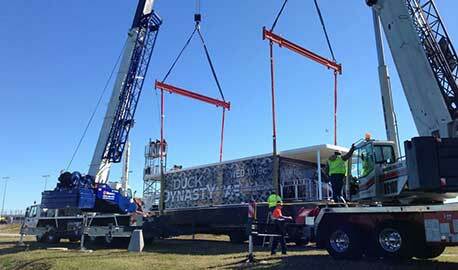 We proudly provide crane service, sales, and rentals to those in Jacksonville & elsewhere throughout Florida.